The Dreamton Mattress is our signature mattress design, made in a variety of materials, sizes, and firmnesses for a feel that’s all luxury, and all about your preferences. With a soft yet supportive feel, our Green Cotton and Wool Dreamton is a little on the firmer side, but still more yielding than our Boulder Dreamton line — perfect for sleepers who like a medium-firm feel to their mattress. With a fluffy Green Cotton core wrapped in our most luxurious natural wool, this mattress is 100% natural and spring-free and doesn’t transfer motion between sleepers. In sizes from crib to California King — and in custom sizes, too — these all natural mattresses offer an eco-friendly and hypoallergenic alternative in every size. Here at White Lotus Home, we hold our shepherds to the highest standards of quality and ethics. Our sheep are raised on rotating pastures to prevent erosion and overgrazing, and their beautiful wool is never treated with chemicals or flame retardants. Wrapped in a layer of the finest wool we source, the Dreamton mattresses are naturally antimicrobial and dust mite resistant, and require no flame-retardant chemical treatments to be safe. Wool is comfortable in the summer and winter, thanks to its natural insulative properties. The Dreamton is a mattress without springs, and as such won’t transfer motion between sleepers. We recommend putting it on a box spring set or platform bed, or even using it as a floor bed. A slatted bed frame is recommended for air circulation and the slats should be at least 2.5" wide and no more than 2" apart from each other. When the slats are more than 2" apart, that may affect the longevity and comfort of your mattress. 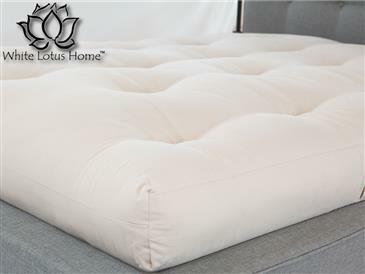 Supportive and soft, the Dreamton offers a medium-firm feel, in healthy and non-toxic materials you can feel good about curling up against. Great mattress! Supportive without being too firm. Easy care and peace of mind that my husband and I are sleeping on a super healthy mattress means everything to me! We are thrilled to have this beautiful company and product in our life. It’s a memorable moment when you purchase, receive and LOVE the first bed you’ve given to your son. The weight is just right. It’s firm but giving, and you seem to melt into it. The service has been remarkable wonderful too. I bought one of your mattresses because of allergies related to off-gassing of mainstream mattresses and am happy to report that I have had NO problems since sleeping on a white lotus cotton and wool mattress!!!! I purchased the same mattress for my daughter 3 years ago, I wouldnâ€™t have ordered another if I didnâ€™t love it. Both have proven to be comfortable for the kids and I donâ€™t mind staying in bed with them for snuggles. Love the mattresses! Have 3! Organic bed mattress was great. Very high quality except for the upholstery pin sticking up. I let the company know and they gave me a free pillow of my choice. I like their products. Used daily as a bed, regular rotation makes a noticeable difference. Love it so far! I purchased a mattress for my son, who seemed to have allergies to his previous foam mattress.\n\nI would recommend to anyone whom is concerned about the chemicals that are used to make most mattresses available.\n\nAwesome. Does not sink like every other mattress we have had. December 2013 Tania Cooper We have two all green cotton twin mattresses for our children. I end up sleeping with our toddler at some point most night because she is still nursing. The mattresses are so comfortable and I feel good knowing my children aren't breathing in any harmful chemicals. They have a wonderful natural cotton aroma - my son's still does after nearly five years! His mattress is still in excellent shape with rotating it every couple months. I will go back to White Lotus again and again! We are saving up for a King mattress of our own. I am so comfortable on this mattress. I bought an ikea bed frame (Hemnes) and it seems to work. My bed feels so cozy and snuggly but very firm. It smelled like wool for the first couple of months and I wish it still did. Hello, What's the difference in firmness between different thickness mattresses? Thank you for your interest in our handcrafted bedding. Our standard cotton mattresses (with or without an inner core) measure 6" deep, though we do offer mattresses as thick as 8". The 6" standard comprises the majority of our mattress sales, as most customers find this to be sufficient. The thicker varieties are constructed less to generate a different "feel" and more to provide options for those whose bed frames or personal preferences necessitate a deeper mattress. In regards to firmness, most people do not experience a difference in feel after the initial loft settles. The raw fibers within should be proportionate to the width of the case and, therefore, be comparably firm. If you have any further questions, we can be reached by email or by phone at (732) 828-2111. Thank you for your inquiry. The main difference is the thickness and the 6" mattress has handles on the sides. The futon is made at a 5" thickness where a mattress starts at 6" and can go up to 8" thick. what is a "stow" mattress?